He has a short snout and a long name. 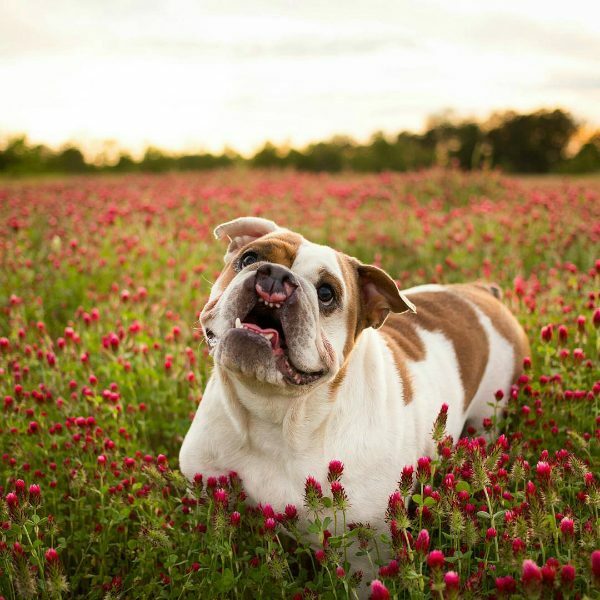 Born with a severe cleft palate and lip, J. Alexander Hamilton is a 2 ½-year-old Bulldog whose life story is as dramatic and inspiring as any Broadway musical. “We weren’t going to name him at first because we didn’t think he was going to make it,” Hamilton’s human, Nicki Williams, recalls. The Birmingham, Alabama, veterinarian and her husband, Aaron, took custody of Hamilton when he was just 2 days old. Hamilton wasn’t born at the Galleria Animal Clinic where Nicki works, but ended up there after his breeder’s attempts to feed him were unsuccessful, and a Galleria client suggested seeking help at the clinic. When Hamilton was turned over to the clinic, Nicki agreed to foster the newborn pup. She and her husband already had six adult rescue dogs of their own at home, but figured this poor little puppy needed her help, and likely wouldn’t survive the night anyway. After 24 hours of constant care, the unnamed puppy was still hanging on. Nicki remembers how she — and especially her husband, who had never had a puppy before — quickly grew attached and decided their little pup needed a name. They called him Hamilton — Hammy for short — because his tiny pink nose reminded them of a piglet’s snout. The initial J matches a letter shaped mark on his side. After he was named, tiny Hamilton was quick to secure his place in his new family. Nicki and Aaron weren’t the only ones falling in love with him, the six other dogs were too. One dog in particular — a young Shar-Pei mix named Eleanor — was especially eager to help Nicki with any puppy-related duties. “She’d never had puppies or anything like that, never gone through the hormones, but instantly when she saw Hamilton she was like, ‘that’s my baby, I’m going to take care of him,’” Nicki recalls. Nicki credits the older dogs with filling the role of littermates in Hamilton’s early life. 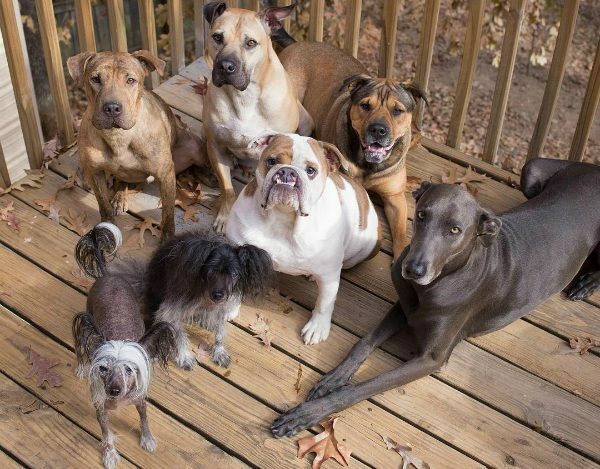 The pack helped socialize Hamilton and teach him appropriate dog behavior while the humans in the household took care of Hamilton’s other needs, bottle feeding him all hours of the day and night. Weaning Hamilton off the bottle wasn’t easy, but eventually Nicki found a solid food diet that Hamilton could eat without trouble. It helped that his cleft grew together better than expected. “It’s not closed by any means, but it’s almost touching in most of the parts,” she explains. When Hamilton was 8 weeks old, Nicki discussed adopting him out to a client, but found she couldn’t break the bond between Hamilton and Aaron. 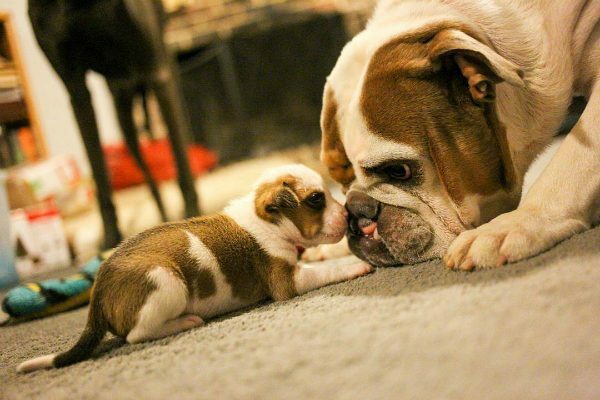 Nicki’s husband was completely in love with the little guy, doting on him and eventually devoting his Instagram account to the Bulldog. Over the last two years, Hammy’s social media followers have seen him blossom into a happy, pampered pooch. Aside from an ACL tear that saw him temporarily using a sling and wheelchair, Hamilton has been a pretty healthy dog. Nicki says what’s happened for Hamilton can happen for other cleft palate puppies, as long as humans recognize that these puppies are not worthless. Nicki suggests that folks who find themselves trying to help a cleft palate puppy seek support from groups like For The Love of Ruby or The Mia Foundation. “There’s options for them. You just have to contact the right people,” she says. Since adopting Hamilton, Nicki and Aaron have continued to foster other cleft palate pups — and plan to continue in in the future. 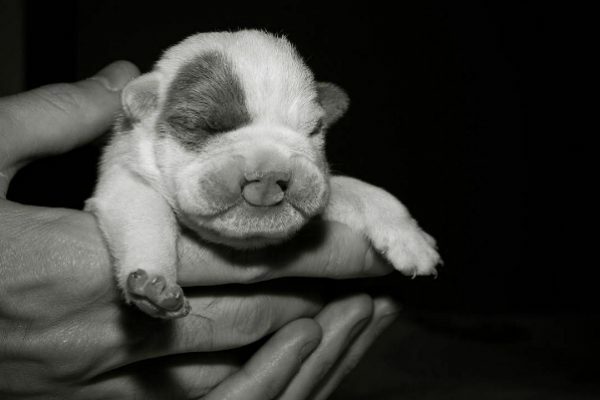 “We will always have space for a cleft palate puppy, always,” Nicki explains. The post J. Alexander Hamilton Proves That Cleft Palate Puppies Can Grow Up to Be Healthy, Happy Dogs appeared first on Dogster.